The AULL Tag Team Titles is a major championship promoted by Alianza Universal de Lucha Libre. Sádico (AULL) & Yoruba, 15th Champions. 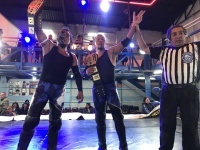 2) Silver Cat I and Silver Cat II were the second AULL Tag Team champions, defeating first champions Epidemia & Robin Maravilla in the finals of a losers advance tag team tournament to claim the titles. Iron Love & Chucho el Roto defeated Terry 2000 & Rey Krimen in the finals of a one night tournament to win the title. This page was last edited on 18 December 2018, at 04:16.